Audio editing is a practical resource for enhancing and fixing audio quickly, meanwhile, a crucial skill to successful professional sound production. No matter you are a newbie to audio creation or a practitioner of music, what you need is a suitable audio editor to fulfill your audio editing needs, nothing more, nothing less. There are plenty of audio editors out there and you could quickly get access to them via the search engine – but how can you tell good from the bad before using them? We’ve tested 30 audio editor products, which are the most popular and famous ones, including free and paid audio editing software as well as (web-based) online audio editor tools. Reading our reviews before you download or purchase a product could save you much time from making your decision or regretting the money already spent. For most of us, audio editing could be useful, but not that crucial. We don’t want to pay for a thing that is for occasional use, right? Free audio editor software is the handy choice to edit audio without paying anything. Some audio editor freeware can even provide more usability than the unqualified paid ones. Meanwhile, you should be careful with the freeware – sometimes they’ll come with additional software that you don’t want to install. In a word, free audio editing software is good enough for amateurs. Free Audio Editor is one of the best free audio editing software that does a decent job on recording and editing audio. It can capture any sound from any resources, including analog audio like vinyl records & cassette tapes. Like most of other easiest audio editors, it provides a waveform window to perform your editing. There are over 30 audio effects and filters. It also offers audio restoring and noise removal features. You are allowed to burn CD and rip audio CD. There is also a batch audio converter to convert audio files or extract audio from video. It provides customizable quality or ready-made preset to change the output quality or adjust the audio effects. Real-time preview is supported. You can merge audio files and insert TTS (text-to-speech) audio. There is also frequency analysis and spectral analysis. It has a YouTube downloader to download video. Free Audio Editor is brainlessly easy and can do almost anything that a regular user would want. However, it is not a multi-track editor and it does not support MIDI. If you want an audio editor that can record and edit audio & MIDI in multiple tracks, maybe you should consider purchasing a professional audio editor. 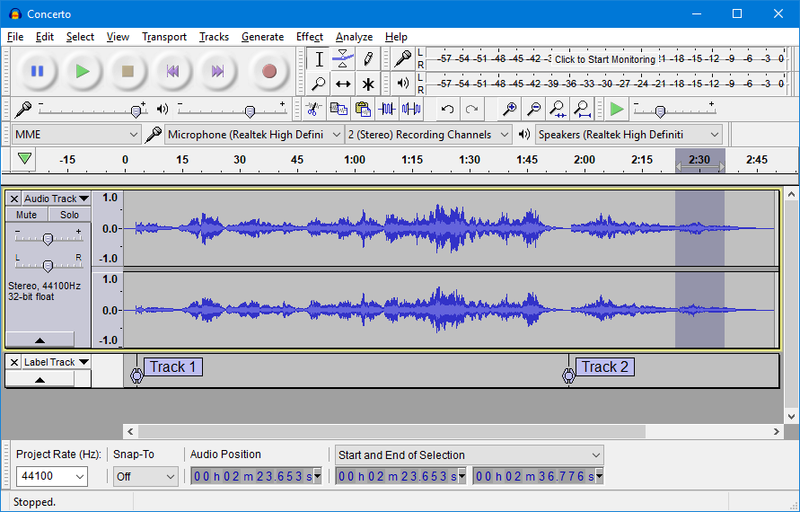 Audacity is free and open-source audio editor software, which is very powerful to record and edit audio. It is compatible with Windows and Mac OS. Its UI is a bit complicated and the buttons are small, but it bundles everything into an uncluttered interface. Audacity is a good start for users who want to dig something out without paying a cent. You can learn some basics of audio editing and manage to use some tools. It’s not brainlessly easy but give it some time to amaze you. Audacity has a slow startup and it crashed several times when we are trying to adding some effects or pasting some clips. The interface is outdated. However, it’s editing and effect plug-ins are convenient, making audio enhancement easy. Ashampoo Music Studio is single-track audio editor software. Its UI looks modernized and is very easy to use. It is suitable for smaller audio monitoring tasks like audio splitting, trimming, normalizing, etc. You can cut, copy, paste and add several audio effects. You can play the music with the built-in player, which allows you to build a playlist by importing audio files or whole folders. You can extract audio from video, edit tag info and convert between several popular formats. Ashampoo Music Studio does not provide any noise reduction or removal tool/filters. You can’t download online music to edit. It also lacks CD burning & ripping tools. It includes everything for basic editing needs, but it’s not ideal for users who are seeking advanced features. 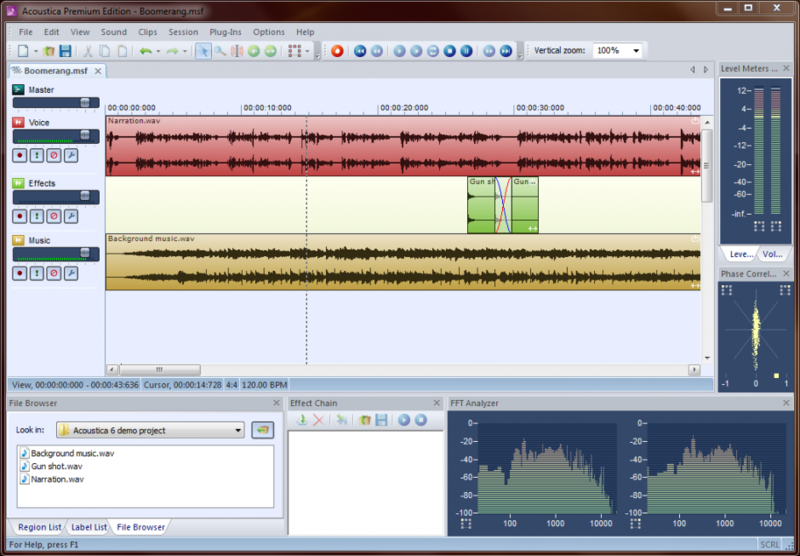 Wavosaur is a free and powerful audio editor to record and edit audio. Its UI looks decades old. It is a tiny program (less than 4 MB) and does not require installation, which is very impressive because even with this tiny size, it does not compromise on the usability. It packs as many advanced features as it could: batch conversion, resampling, pitch shift, vocal removal, auto-trim, silence removal, crossfade, analysis tools, etc. It also allows the installation of ASIO drivers and VST plug-ins. 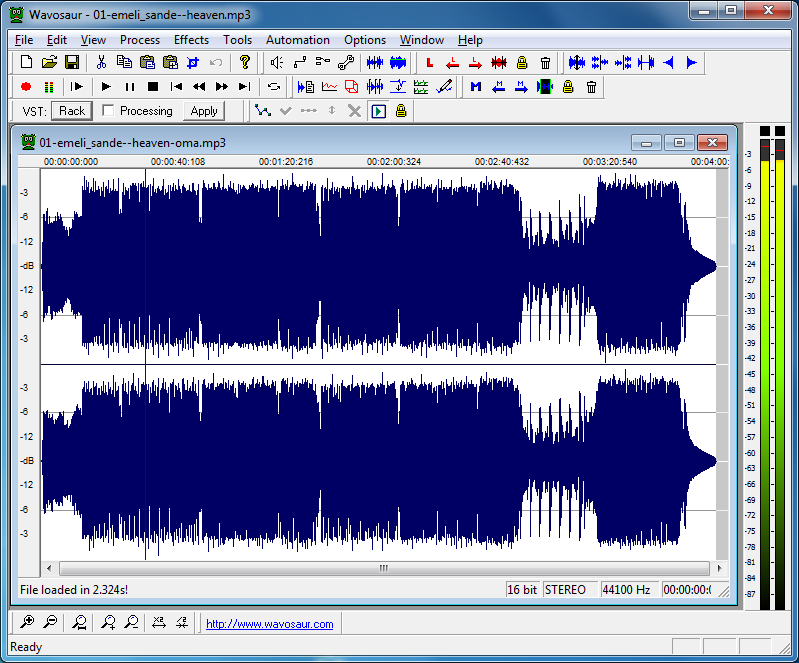 Unlike other free audio editor software, Wavosaur supports MIDI. 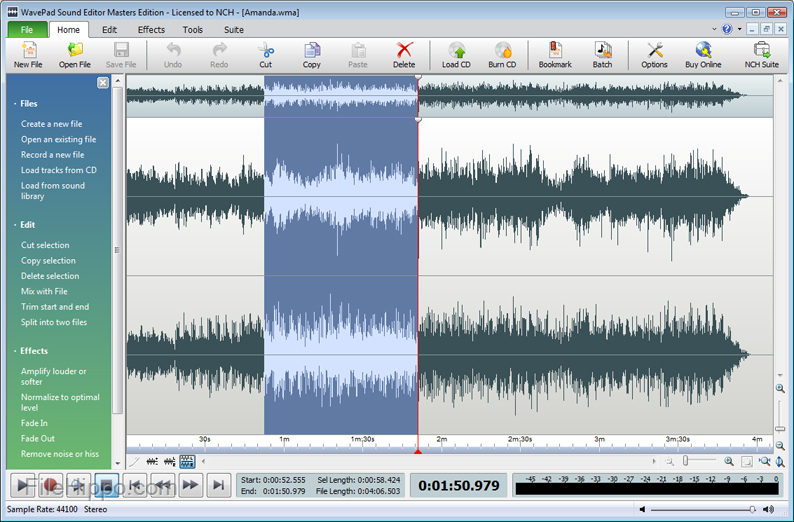 Wavosaur is a portable audio editor, which is flexible to monitor audio files. It does not include a CD ripper and a CD burner. Its UI looks outdated and “techy” – inexperienced users may be a bit confused. If you are looking for something brainless with a fancy look, there are better choices. 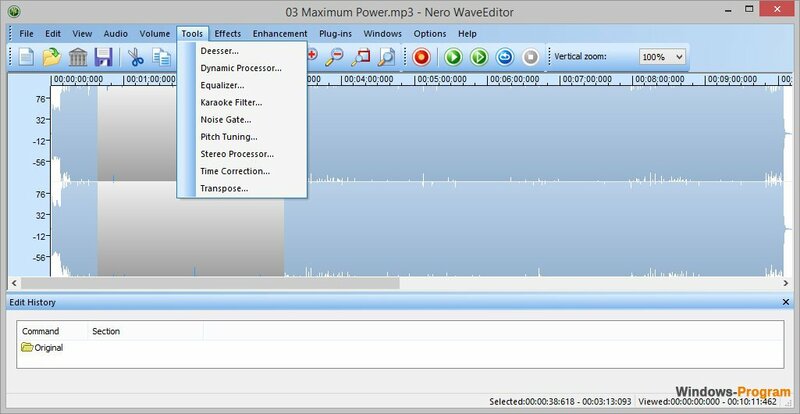 Nero Wave Editor is a rudimental audio editor that provide basic editing features. It does an excellent job on editing & cutting most audio formats. You can convert audio files between several formats. You can apply several audio effects including normalization, fade in/out, etc. and it supports real-time preview before mixing down to the file. It allows you to create custom presets. Nero Wave Editor is a mediocre one, which can do many tasks but does not score well in all the aspects we test. It lacks many advanced features that can be found in most of its competitors. You can find no support or guidance of this editor on its official site – it seems that its developer does not put interest into it anymore. Ocenaudio is a lightweight audio editor that’s designed especially for regular audio editing. It is a waveform editor that can make precise editing and other changes. It supports almost all the regular audio formats. You can easily cut, copy, paste & trim audio and add a host of audio effects like delay, fade, reverb, vibrato, etc. It includes some noise reduction filters. You can preview the audio effects in real time. It also provides spectral analysis and supports VST plugins. Ocenaudio does not provide disc burning or ripping tools. Meanwhile, it does not support stacks of effect. It is an excellent choice for users with casual audio editing needs, but it does not include a disc burner/ripper. 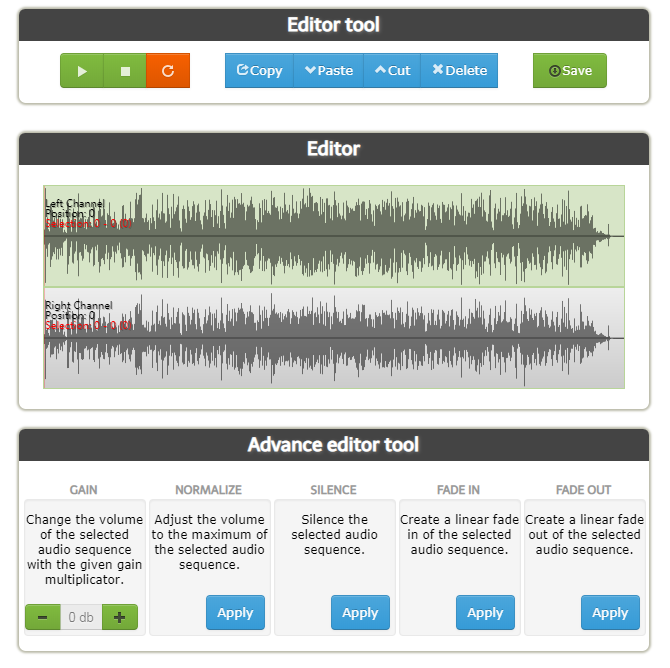 WaveShop is another free and open-source audio editor software. It is lightweight (less than 4 MB) and designed to be bit-perfect, which means it won’t change your audio if it’s not necessary, e.g., if you input an audio file and save it without making any changes, the resulting file will be the same as the source file. It provides a visual waveform for you to work on. You can cut, copy, paste, trim the audio and apply various audio effects like normalization, amplification, fade in/out, reverb, invert, as well as EQ, compression & other effects via LADSPA plugins. It also provides a real-time spectrum analyzer. WaveShop provides a portable version which does not require installation so that you can put it on your flash drive and use it directly any time you want. WaveShop is not able to rip or burn CD. It’s quite easy to use, but the interface looks old. A few advanced are missing while they are available in many other audio editors. 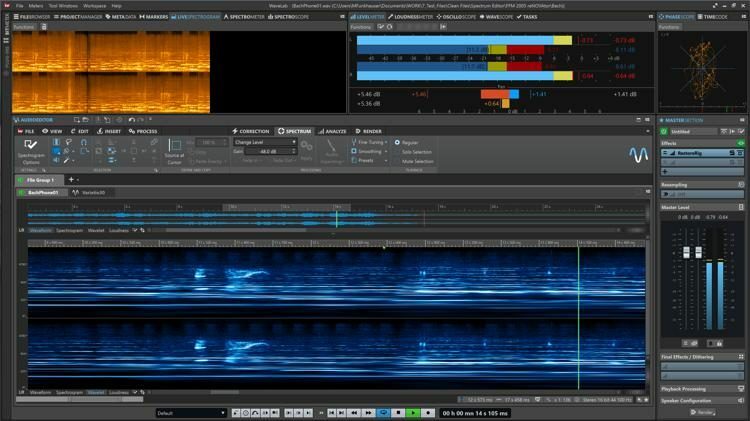 Ardour is an open-source audio editor which provides professional, non-destructive and non-linear editing audio editing and flexible audio recording. It supports multi-track recording and editing of both audio and MIDI files & the number of the multichannel tracks is unlimited. You can cut, move, copy, paste, delete, stretch, align and trim your audio and apply a ton of customizable audio effects. It also provides a vertical stacking mode to display overlapping regions. It supports plugins like VST, LV2 and AudioUnits. Ardour is one of the best open-source audio editors for audio engineers, musicians, soundtrack editors and composers. If you are on a budget and need a DAW to help with your audio editing work, Ardour is a second-to-none choice. If you are a beginner, maybe you should start with something easy instead of a DAW. Try other free audio editor software. 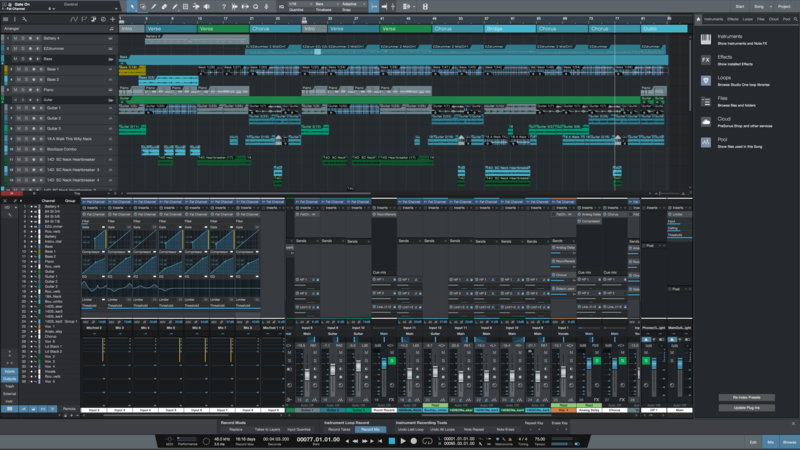 Like Ardour, Mixxx is a free and open-source DAW. It is integrated with all the tools that can be expected from a DJ to create the stylish and unique live mixes. It supports BPM & key detection so that you can find the perfect track to mix from your musical library. You can also use the master sync feature to match the tempo & beats of 4 songs to seamlessly mix them. It provides a ton of audio effects so you can add some unique and creative spin. You can also choose the theme skin. 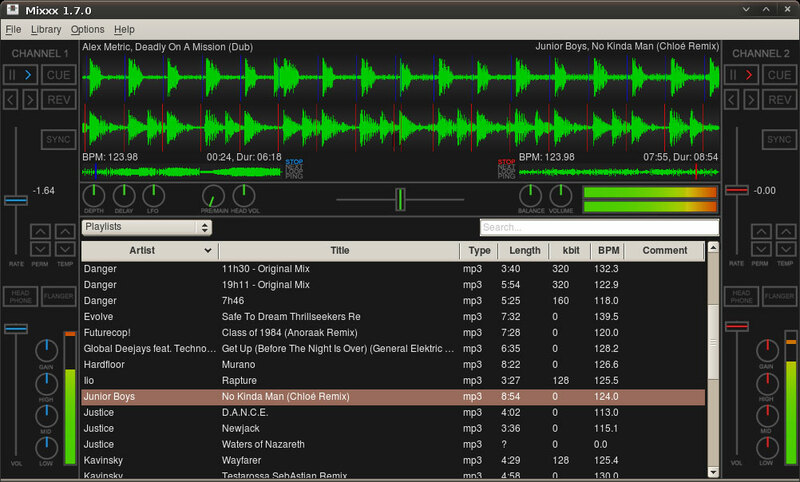 If you are a DJ or want to be a DJ, Mixxx is the perfect tool. The words to help starters on the manual and official website are intuitive. There is no disc burner or ripper. 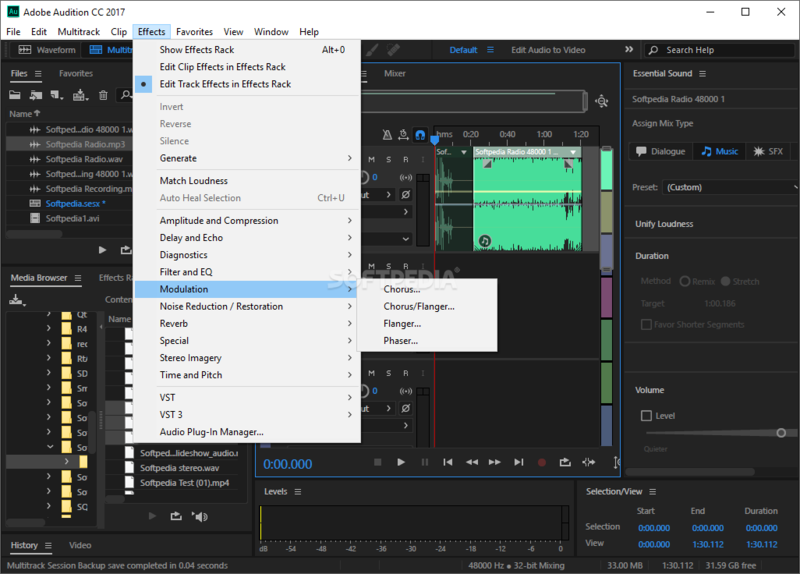 DVDVideoSoft’s Free Audio Editor is an easy tool to edit audio and add audio effects. It comes with a neat and straightforward interface. You can drag and drop your file. It allows you to cut, copy, paste and perform some other basic editing. It provides a waveform so that you can make the editing accurate. It gives you a wide range of output formats. Meanwhile, you can convert audio files between several popular formats. DVDVideoSoft Free Audio Editor lacks many advanced features. It can’t edit stereo tracks individually. There are no filters other than volume. It can be handy for temporary use with essential editing needs, but if you want something that does a pro-level work, there are better choices. If you are an expert with high-standard and accurate needs, freeware may not be enough. If you feel more and more missing features in your free audio editor, it’s time to switch to a pro-level paid product. Spend your money right! Don’t waste them on the unqualified ones that can’t even compete with the freeware. If you are in the serious music industry, picking a good audio editor is the start of the success. Every time you launch Adobe Audition, you will surprisingly find something new – that’s what makes the high annual cost worthy of it. It can do almost anything you want with audio. It supports multi-track recording, which enables you to capture audio on multiple tracks with multiple microphones. It also supports multi-track editing and you can apply a large number of audio effects. Its fixing and restoring tools are the best. The Adaptive Noise Reduction can be used as a track effect to reduce/remove the noises brilliantly. It also provides many other tools like spectral analysis, envelopes, loudness matching, etc. Adobe Audition is a very flexible and robust audio editor, but the annual subscription-based fee is $239.88, which is not an affordable level for most casual users or long-term use. It is recommended for professionals who are seeking superior quality, services and updates, but if you want to buy an audio editor with a lifetime license, there are plenty of them out there. Acoustica has a neat and straightforward interface, with well-arranged workspace & layout as well as perfectly matched colors. It provides many groups of audio editing features, audio effects and many related tools like the player, FFT analyzer, etc. You are allowed to rearrange the toolbar to keep only the most used tools, making the whole workflow fluent and effective. Acoustica supports multitrack editing, which means you can input multiple audio tracks into the program to edit them concurrently. Acoustica Standard Edition is very easy audio editing software for inexperienced users. It doesn’t allow multitrack recording like Adobe Audition, but that’s not quite the problem for regular users. It also provides a free version with limited features. WavePad is full-featured audio editor software for both Windows and Mac users. Its interface is friendly and neat. It allows you to record audio, edit recordings and local audio files and add audio effects to your audio. It is compatible with a bunch of audio files formats and it also works as an audio converter to convert audio to your target format. Like the Acoustica, it allows you to customize the toolbar, letting the frequently used tools appear on the ribbon. WavePad took much longer time to add audio effects during our test. It does not allow multitrack recording unless you install a software extension. Basically, it is a satisfying product for users of all levels, but if you have a strict requirement for the time used on applying audio effects, there are better options. Reaper is a multifunctional audio editor that can do almost anything you want with audio editing. You can build your own commercial or home studios, and create audio for broadcast, education, sound design, game development, research, etc. It’s more a DAW than a rudimental audio editor. There are a vast number of audio editing and sound effects plug-ins. It allows you to record as many tracks of audio as you want in one session. 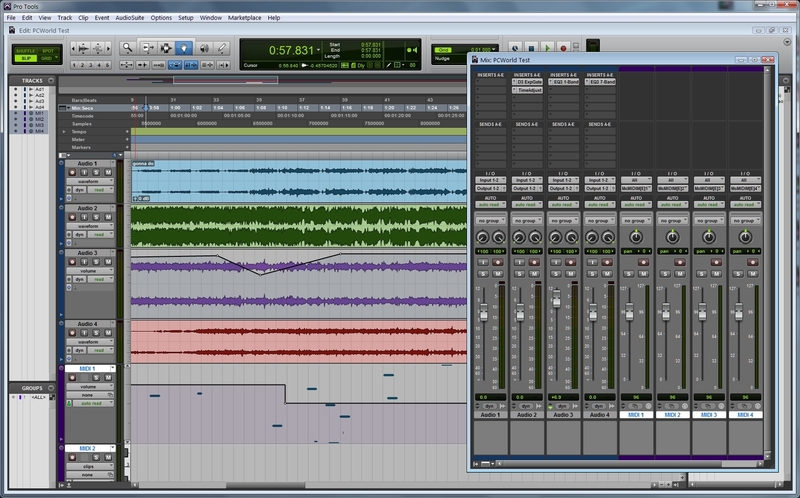 Reaper uses less system resource and works faster than most other audio editors. Reaper is not an appropriate audio editor for beginners and it will take much time to figure out all the functionalities. The UI is a bit complicated. It took a bit longer to remove the noise and it does not provide any other audio feature. Its price is fair with all the pro-level features and tools. If you need audio fixing/restoring feature, you can always purchase a third-party plug-in, or consider other products in our list. MAGIX Audio Cleaning Lab is quite intuitive and like mentioned in its name does an excellent “cleaning” job of repairing & restoring audio. There are not many menus that you have to dig into. On opposite to many other audio editors, the visual waveform window is above your workplace. We imported audio files in a mass number of audio formats and REAPER takes them all. It can also work as an audio converter. To check its ability to fix audio, we loaded an audio sample with cracks and pops, recorded from an old cassette tape. We were impressed by the simplicity and usability of the restoring tools – the results are satisfying. MAGIX Audio Cleaning Lab is limited in its recording feature; meanwhile, it does not provide as many audio effects as other competitors; the “Undo” feature does not work as well as advertised. It’s a fine audio editor to fix your damaged audio or remove noises, but you can’t rely on it to record audio or apply certain audio effects. PreSonus Studio One is a mature DAW that makes your audio processing workflow smooth. It is very fast for audio recording and monitoring. It takes fewer clicks than several other DAW tools to record and edit audio. You can trim and split the audio clip, add a ton of audio effects like fade, echo, etc., adjust the gain, and do a lot more. PreSonus Studio One is integrated with genuine Melodyne pitch correction. PreSonus Studio One is a robust DAW with powerful smart editing tools. However, it’s only for pros because its interface is intimidating with all that buttons, menus and whatnot. The mixing console is cluttered. You won’t be able to get everything you need on the screen at once because the UI can’t scale to higher resolutions. Ableton Live is a track-based Digital Audio Workstation and you can record and edit audio (MIDI included). It has a smooth and simple workflow and a resizable UI. Its recorder is so far the easiest. It is not that similar to other DAWs, but you won’t have to remember where the features you need are or how to use them, because most of them are quite self-explanatory. Audio warping is one of the fantastic features of Ableton Live, in order to manipulate the audio rhythm, tempo & pitch. 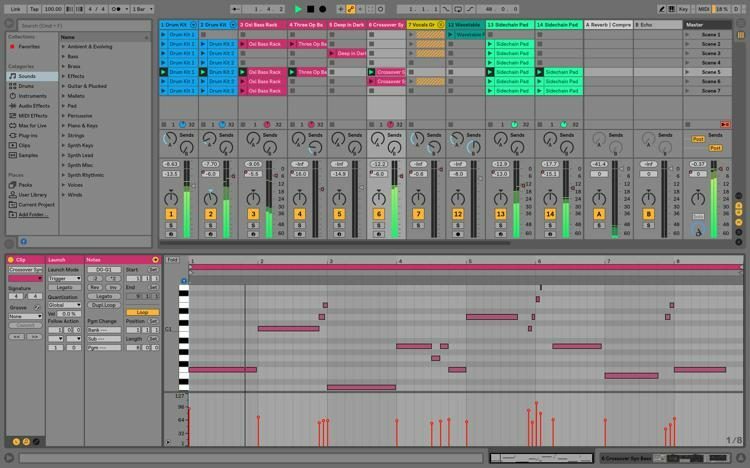 Ableton Live is a bit pricey – the $99 Intro version allows you to work on up to 16 tracks, but if you need more instruments and more audio effects, you may need to upgrade to Standard version or purchase the Suite. It has no notation or audio source editing. Its output options are limited. Sound Forge Pro is a waveform audio editor, which was developed by Sony but then acquired by MAGIX. In general, Sound Forge Pro is one of the fastest in our list to edit audio. The workflow is also smooth and efficient due to its clean layout, well-organized feature set and easy-to-read icons & buttons. You can record audio in a matter of a few clicks. It allows drag-and-drop to input audio files. The visual waveform makes the editing incredibly easy and precise. It can also be used to fix audio and remove noises. Sound Forge Pro can work with multi-channel, but it is not a multi-track audio editor. Meanwhile, its UI is outdated. It cannot compete with the DAW when it comes to pro-level monitoring, but it has almost everything that you seek in an audio editor. 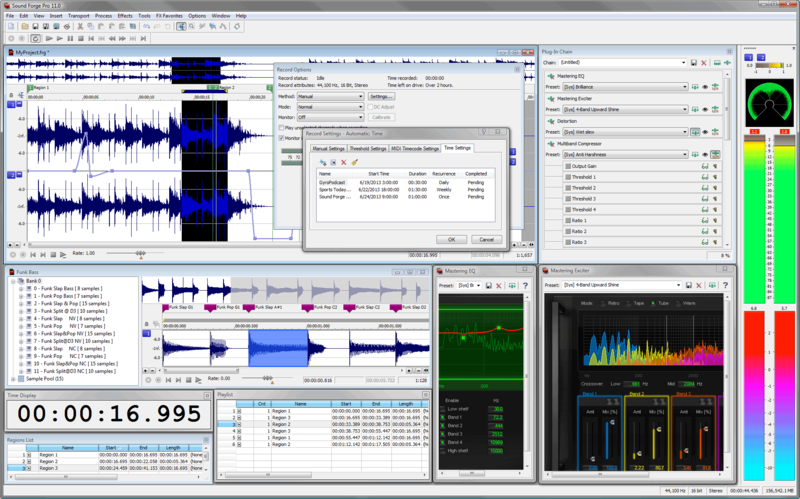 WaveLab Pro is a high-end audio editor developed by Steinberg. Like its older version, the latest version of WaveLab Pro continues the tradition of visualizing audio editing. You will find anything you expect on the interface. You can perform the regular editing operations as well as applying EQ, compression, add a mass number of audio effects and change audio frequencies, channels & perceived level. For rendering audio, you are allowed to choose appropriate formats, bitrate, sample rate and bit depth. WaveLab Pro is not that easy compared to a few other audio editors but its help content is well-written & easy-to-navigate. You can download the 600-page manual to guide your work in case you want to do them offline. Avid Pro Tools provides the cleanest audio editing along with the fast audio recording & audio mixing engine. It even gives a bunch of cloud-based project collaboration tools. It makes a great example of cross-platform audio editing solution. There are 2 main windows on its interface – Edit & Mix. In the Edit window you can do all the audio recording, arranging and editing work. 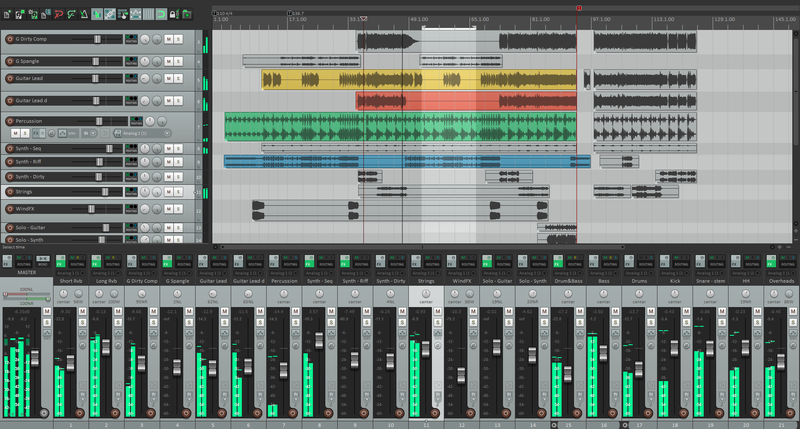 The Mix window will display all the loaded tracks in a mixing board style. You will get more than enough options to mix audio tracks in the way you want. Avid Pro Tools is no doubt one of the best, but it does have a drawback that annoys many – it uses a USB dongle called “Pace iLok” for copy protection. With $599.00 you can own the program for a lifetime, but you can’t get free update after 12 months. It does not provide any pitch correction feature. You won’t find any VST plug-in support or instrument track presets. Sometimes you just don’t want to install anything on your computer; or you don’t have the time to find a reliable audio editor software – that’s why you need an online audio editor. Web-based audio editors can work on almost all platforms and mostly, they work for free. They are usually limited in features and won’t be able to handle huge-size files. Online audio editors are fine if you are in need of processing some small files, but it won’t work well on bulky tasks due to the long time required for uploading & downloading files. TwistedWave Online is a browser-based online audio editor which can record and edit audio in your browser. It supports drag and drop. You can create a free account to keep your files. You can drag your audio file and drop it on the “Drop a File” box. Or you can click “Upload a file” to open it in an explorer window. To create a new file online, hit on “New document”. You can also import audio from Google Drive or SoundCloud. You are allowed to cut, copy, paste and crop audio as well as add audio effects like Fade in/out, normalize, amplify, silence, stretch, etc. You can also convert between mono and stereo. When you are done with editing, click “File – Download…” and choose the format and quality you want in the pop-up window. Click “Download” to get your files to your local drive. It allows you to edit ID3 tag info. Apowersoft Free Online Audio Editor is an effective online audio editor to edit audio rapidly. You can cut, copy, paste, trim, merge & split audio. You can also add many audio effects, append & mix audio. It supports many audio formats including MP3, WAV AAC, FLAC, M4A, etc. To use Apowersoft Free Online Audio Editor, you need to download and run a small launcher EXE file. Then, click “Launch Application” to open the editor. Click “Please load an audio file” to open a file. In the “Edit” menu, you can choose the editing features you need and the “Tools” menu provides some advanced features. The editing is very precise (milisecond precision). “Export sound to…” button at the bottom is used to save and output your file with a few optional output formats and quality presets. Apowersoft Free Online Audio Editor does not provide Google Drive support. The editor window is not adjustable by dragging the edges. There is no regular audio effects or filters. You can’t change the individual codec settings. 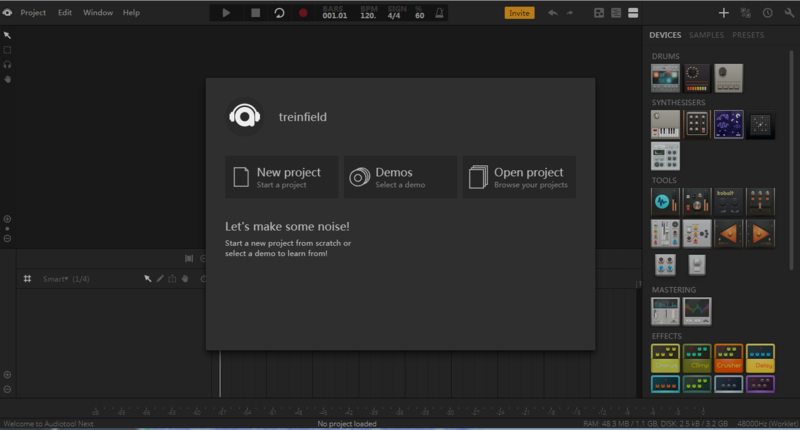 Audio Tool is a mighty online audio studio that requires registration. 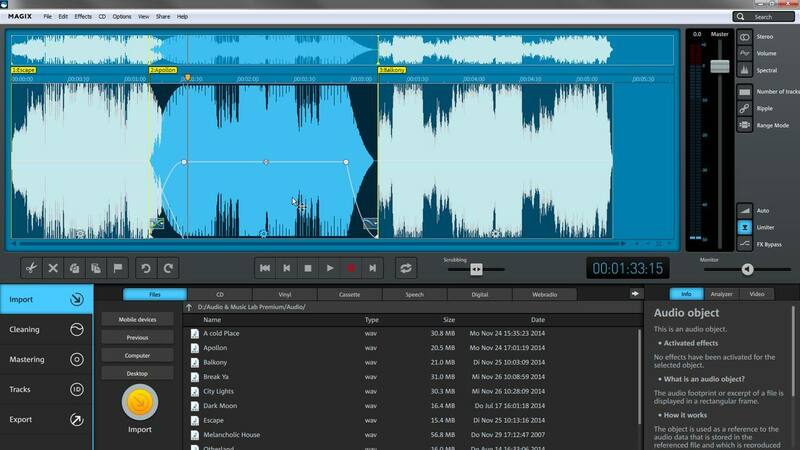 This online DAW can help you with all the audio recording and editing work. It provides many professional online tools that you can find in other DAW software. After you register and log in to your account, you can see a beginner guide video on the top. It is suggested that you watch the video first. If you are an experienced user, click the link below the video, with the text “get started by launching the app”. A new page will be opened to launch the DAW, which will take a very long time due to the abundant features. Audio Tool is definitely not for newbies and its processing speed is much slower than other regular audio editors. If you are in need of some basic editing, it’s not worth the trouble. However, if you are looking for an online alternative for your DAW, Audio Tool is the best. 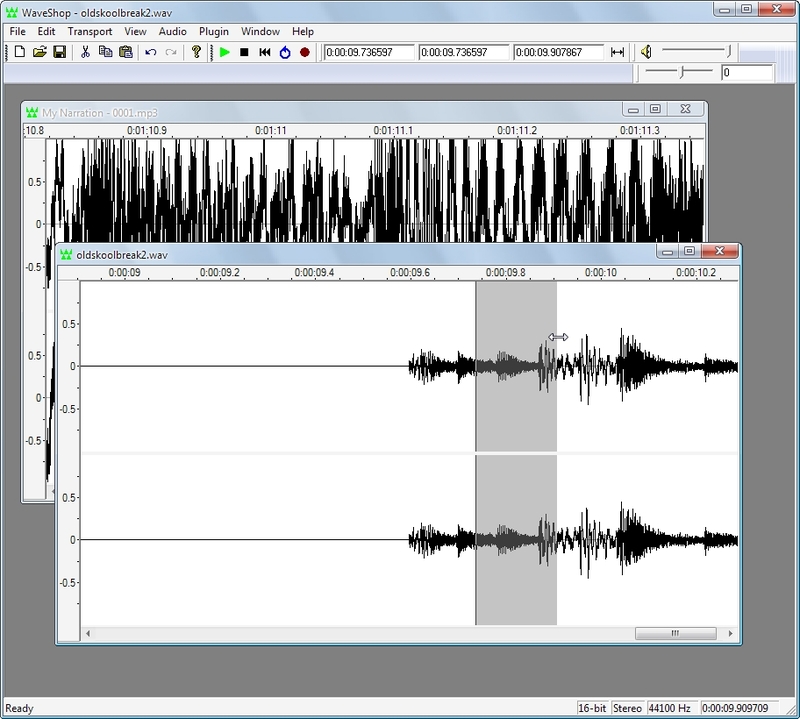 Soundation is an online free audio editor that can record, edit and mix audio. It provides you with a library with thousands of sounds, loops, effects & instruments. It also has a community to enjoy, share & collaborate with music creators. Like Audio Tool, Soundation also requires registration. After login, scroll down to the bottom of the page to click “Get Soundation free” to open another page to launch the DAW. It’s much faster than Audio Tool to launch the DAW. Click “File – Import Audio File…” to upload your local audio. Now you can start your tweaking. The free version does not come with as many tools as Audio Tool, but you can upgrade to the Premium version at 6.99/month. Still, it’s not recommended to novices. Bear Audio Editor is a free online audio converter which is a bit different – it is based on HTML5 so you won’t have to upload your audio files to their server. 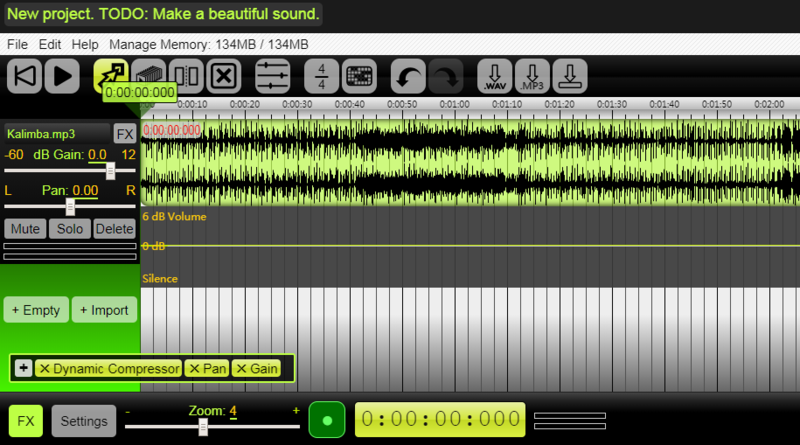 It can be used to record, play, cut, crop, delete & merge audio as well as create ringtones, add audio effects, etc. It supports MP3, WAV & OGG as input formats while MP3, WAV, OGG & M4R as output. It also provides an audio converter. You can import local audio files or open them from YouTube and other URLs. Undo & Redo are also available. Drag your audio file to the “Drag and drop files here” field or click “Open” to find and import it. You can do some basic editing and change the gain, shift the pitch, mute the audio, add fade in/out, etc. Click “Save” to choose the output format and quality you want. Bear Audio Editor is an excellent audio editor for fast editing needs and it includes many useful tools. It provides multi-language support and there is a “Help” button to lead you to a full manual of how to use it, with a video tutorial. 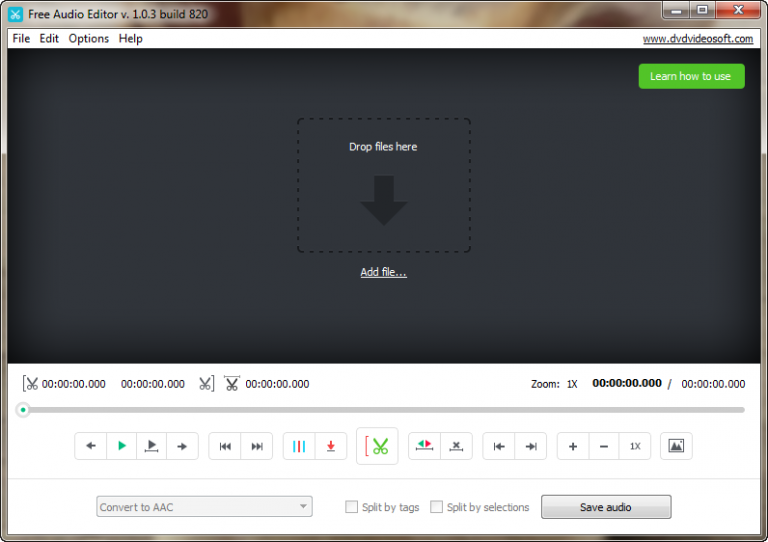 Vidtunez is an online free YouTube video downloader and converter tool, but it also provides an audio editor. You can drag and drop, play, cut, copy, paste & delete audio as well as adjust the gain and add audio effects like fade in, fade out, normalization, etc. On its audio editor page, drag your audio file and drop it to the “Drag audio file here to edit” field. It will show you both left and right channels, but you can’t edit them separately. When you are finished with the editing, click “Save” to download the resulting file. Vidtunez provides fundamental features and is not as powerful as many of its competitors. It is almost a copycat of Bear Audio Editor but with fewer features. It supports only a few audio effects. It supports drag-and-drop, but there is no button to import files from an explorer window. It’s OK for simple editing needs. 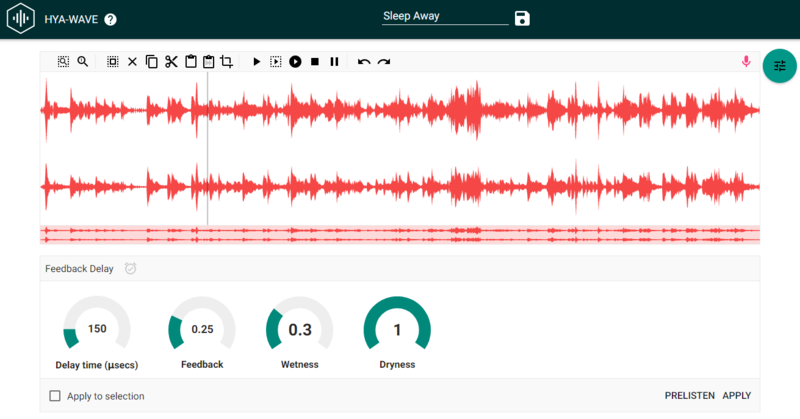 Sodaphonic is a straightforward online audio editor to record and edit your audio. The clean and intuitive homepage is very impressive – no ads, no pop-ups. You are allowed to import MP3, WAV & OGG files. Click “Choose audio file” to find and import your audio or you can simply drag it here. You can also open a file from “Dropbox”. The “Edit” menu provides features to cut, copy, delete, paste, trim audio and you can convert stereo audio to mono. The “Effects” menu gives you 4 options: Fade-in, Fade-out, Silence & Reverse. The highlight of this audio editor is that it supports keyboard shortcuts (although uncustomizable), which are revealed in the “Help” window. Click “File – Export…” to specify the filename, format, quality and choose if you want to download it or save it to Dropbox. Sodaphonic is very fast and smooth to work with. It cannot compete with the DAW tools with these basic features, but it does a fantastic job for users with normal editing needs. Hya-Wave is a super straightforward online audio editor. Instead of wordy content through which you have to find the button actually to launch the editor, Hya-Wave’s homepage is your workplace, with only a few operative words to guide you – very neat and efficient. You can drag and drop a file here or record audio. The waveform is more powerful than its competitors, which shows you both the zoomed waveform and its position in the whole waveform. You can cut, copy, delete, paste, paste & mix and crop audio. Undo & redo is working fine and there is a handy player. You can load FX effects with the top right “Effect list” button, which provides 18 effects & filters. Click the “Save” button on the top and it will save your changes. Click “Download” to get your file. Hya-Wave provides more audio effects than all the non-DAW online editors. However, there are still drawbacks. It does not give a button to import audio in an explorer window; there is neither output format options nor quality options – the output format is WAV. 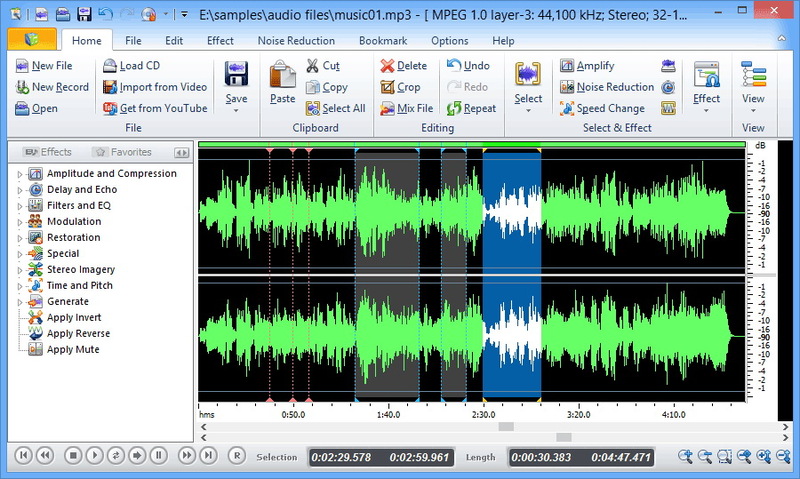 Audio Cutter is a simple tool for online audio cutting. It can output your audio to 40-second M4R iPhone ringtone. Click “Open file” button to import your audio; or you can import audio from Google Drive, Dropbox or an URL. You can easily use the Fade in & Fade out buttons above the start and end of your audio. It allows you to use space to play and stop the audio as well as left and right arrows to move the marker, making precise selection possible. When you finish choosing the part, choose the output format: you can use the source format or choose one form the “More” menu. If you need to create a ringtone for your iPhone, the most effective way is to click the “iPhone ringtone” button. Click “Cut” to start the cutting and when the process is complete, click “Download” to get your audio file. Audio Cutter is not that powerful when it comes to multi-purpose editing. It is specially designed for audio cutting and ringtone making – if that’s what you need, look no further because it does a decent job. Audio Cutter requires you to run Adobe Flash Player in your browser. It does not support drag-and-drop. You have no other audio effects but fade in/out. Beautiful Audio Editor is an experimental audio editor that can record and edit audio files. You are allowed to edit audio while it is being played for quick feedback. You can create projects in Google Drive and edit them within Chrome or Firefox. Click the “Demo” button on the top of the homepage and it will open another page, where you can use the editor. Click “File – Input local sound file” and choose the audio file in the popup window to import. You can perform the editing on the waveform. It provides very few audio effects and filters. When you are done with editing, click the “Download as wav” or “Download as mp3” button to get your file. Beautiful Audio Editor can copy, snip and pan audio but there is no cutting and some basic editing features. It is a bit hard to use it – maybe because it’s “experimental”. Now you’ve read all the reviews of 30 best audio editors. They all have their advantages and weakness. Don’t let the bragging ads fool you – use the trial version before you pay. If you don’t want to download anything before deciding which one to use, go to their help manual or website to find the tutorial, or YouTube to look for a demo video. Here we provide our top choices for each category based on our research. Free Audio Editor is the best free audio editor software due to its simplicity and usability. It provides as many as audio editing features, pro-level audio effects and filters as some of the paid audio editors. Recording, editing, enhancing, burning, ripping, conversion, TTS, spectral/frequency analysis, noise reduction, video to audio conversion, video download, etc. – it can fulfill all the needs of a casual user. Adobe Audition is the best paid audio editor software, which is a DAW. It is the most intuitive professional audio editor. It allows you to record from multiple audio sources on different tracks concurrently, which is a rare feature. The subscription fee is $239.88/year, which is higher than its competitors, but like others said, go big, or go home. You won’t be disappointed by its constant update and service. There are many online audio editors that can do a decent audio editing job. TwistedWave and Apowersoft are two great examples. Both of them are easy to use. TwistedWave provides more editing features, while Apowersoft works faster & also gives a desktop version. 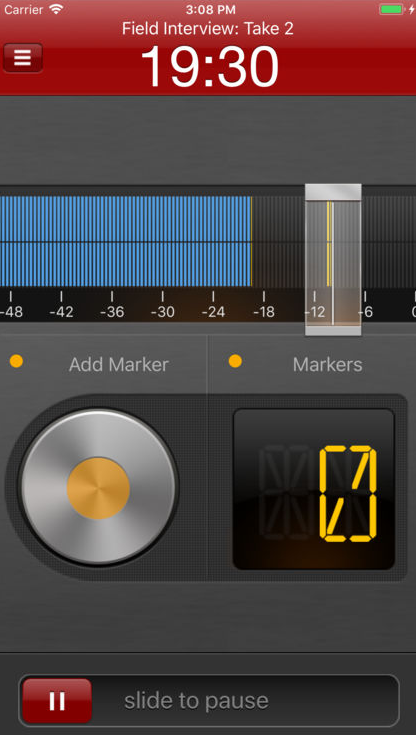 Have you ever felt the need for recording and editing audio with your iPhone? Maybe you need to capture some job assignments, or you come across an amazing unknown song and have to get it saved so that you can look for it online later; or you need to cut out a part of an audio file, like an irrelevant part from a lecture; or you need to create a wake-up alarm from your favorite song. We are so used to getting these things done on the computer, but now these basic audio editing and recording needs can be easily fulfilled on your iPhone. When you record an audio file, you can employ some audio editing apps for iPhone to edit and enhance it. Here we’ve picked up several audio editor apps from the most competitive ones to help you record and edit audio as well as create music. 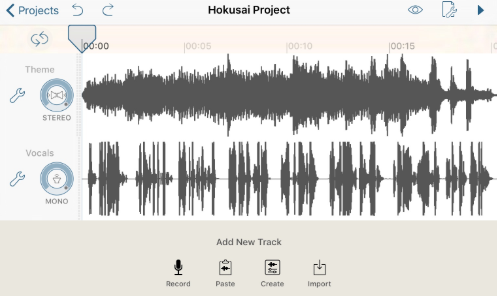 Hokusai Audio Editor is an iPhone audio editor app that can filter out the noise of your recording and cut out the unneeded part. It’s simple to use and what you need is to follow some straight directions to get audio cut, copied & pasted, deleted or trimmed. When you open your audio with Hokusai Audio Editor, it will show you the waveform of the audio, which includes the highs & lows of it. You can zoom in the waveform to 0.1 seconds for more accurate editing – not as precise as what we have in the audio editor for desktop/laptop, but acceptable and enough for normal use. To snip out a part of the audio, just choose the part and snip it out. You are allowed to add audio effects like fade in/out, echo, normalization, stretch, etc. It allows you to insert or append new audio files to the current track. You can also use the synthesizer to synthesize your sound. There is a mini keyboard to set frequencies to a standard pitch. Undo and redo are supported. GarageBand is like a personal tutor for music lovers who have never learned play any instrument, letting you play numerous Touch instruments on your iPhone, iPad & iPod touch and create your own music anytime you want like a real DJ. GarageBand allows you to import your audio file. You can edit audio, add audio effect and mix audio. To make the editing even easier, some templates (live loops) are provided, like hip-hop, EDM, dubstep, House, RnB and many more. To create new music, there are bass, drums, guitar, keyboard & AMP to help realize your musical idea or remix your beloved song with a combination of the instruments. When you are finished with your masterpiece, you can send it via email or share it between devices using iCloud Drive or posted it on Facebook, YouTube, SoundCloud, etc. 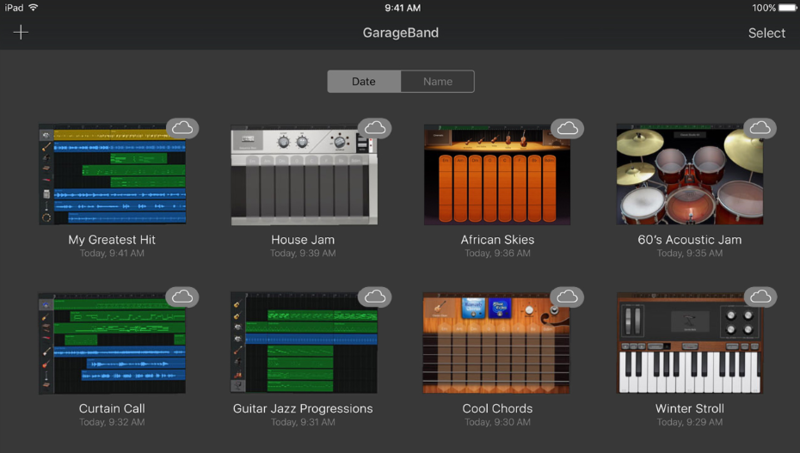 GarageBand is a creative audio editing app, but it’s a bit complicated for casual use. We recommend it to budding artists & garage musicians. Opinion is an easy audio recording and editing app, which can help you create awesome podcasts. It supports pro-level high-quality audio recording on iPhone & iPad. 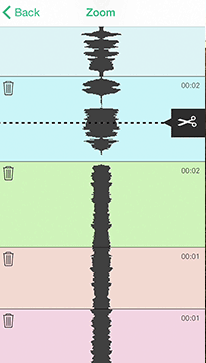 It can also easily snip out an unwanted part from your audio in several steps, e.g., if you want to remove some noise or silence from your audio recording, just tap on the file to play it; then tap it where you want to start the snipping, carry on and tap it again where you want to end the snipping; then you get a separate file of the snipped part – delete it or keep it, as you wish. It’s a very basic audio editor that does not come with bells and whistles: it does not support layers because it provides only one timeline; you can’t add background music to your audio and you won’t be able to add audio effects or filters; you can’t embed any Opinion podcast on a blog or website. The company wants to keep as much simplicity of the workflow as possible. It also gives a “solution”: use the third party storage option like iCloud or Dropbox (you have to have an iCloud/Dropbox account set up in the app) and other third-party audio editing tools to process the recording and then import it back to Opinion – seems a bit silly but that’s the only way that you can add some stunning factors. You can try Opinion for free, but it costs you $4.99 to unlock the unlimited version. After the purchase, you can record unlimited you want as long as your iPhone/iPad can make it. The recording will be appended into M4a format. 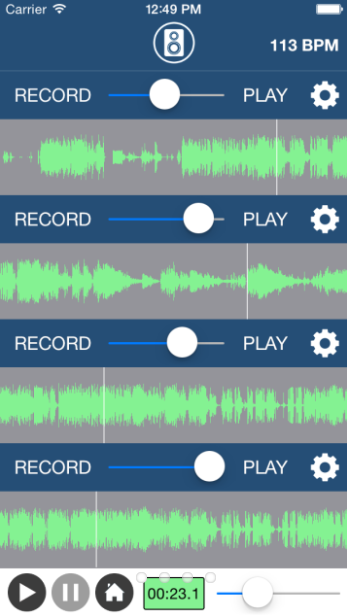 Different from Opinion, Multi Track Song Recorder is a more powerful audio recording app for iOS with many exclusive features (99¢ for the pro version). There are not many light-weighted choices for iOS users when it comes to multitrack audio recording. Multi Track Song Recorder is one of the best solutions as a portable demo studio. It is a 4-track recorder that allows you to layer multiple parts. Each track includes its own volume & input gain control, loop toggling and many other options. 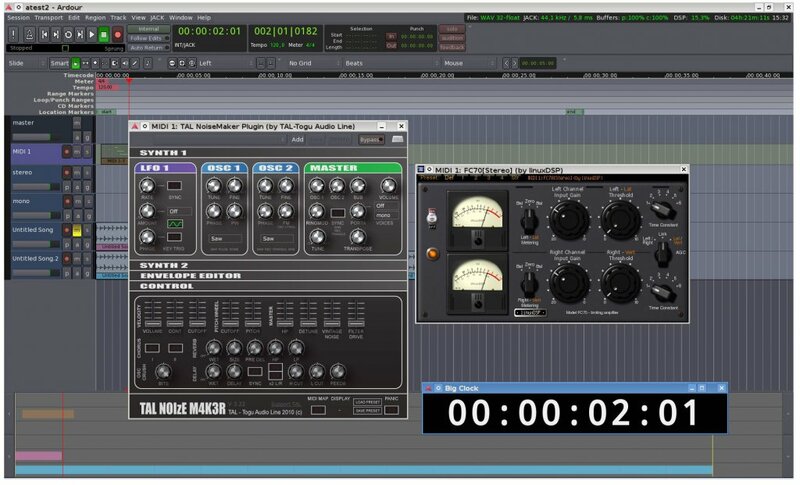 It allows you to merge and layer tracks for creative recording. It is a design for musicians who need to write & record simple demos and other musical ideas on the move. It provides a pendulum-style metronome and you can choose to disable tap sounds or create perfect loops in the metronome options. It can record CD-quality AIFF tracks and mix down to M4a files. It provides a slider to drag to listen to any part of a song. You have many ways to export your songs: you can send them via email or SMS, upload them to Dropbox, and share them with iTunes File Sharing. But it still has some drawbacks: it does not provide editing, Copy & Paste, audio effects, noise gate, punch in, etc. It mainly focuses on quick recording & export. Music Editor: Beat Song Maker is one of the easiest audio editing app for iPhone to record audio, edit audio, add audio effects and perform other basic audio editing like cut, copy, paste, trim, delete, etc. You can snip out the unneeded part, mix music, change the volume, etc. It is developed by an individual (Joel Chue). It provides a 3-day trial and it will cost you $39.99/year to unlock the premium version for unlimited editing. 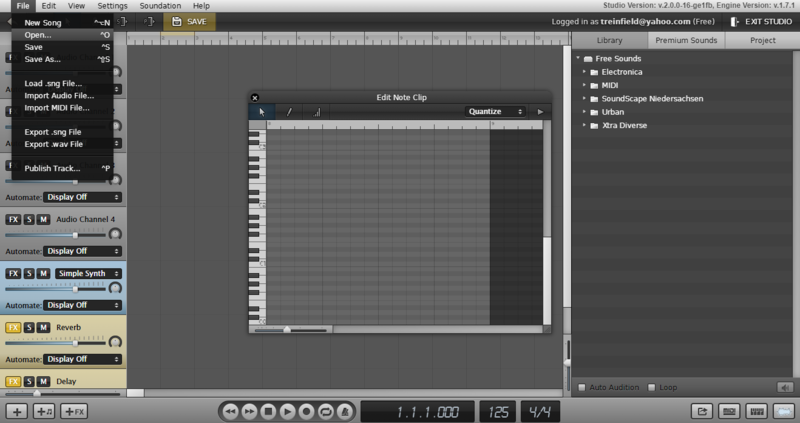 Music Editor: Beat Song Maker allows you to record or import audio. To record audio, just tap the “Record” button and when you are done, you can play the recording back and save it locally on your device. To import an audio file, tap “Import” button to find and add your audio. It supports multitrack editing so after you record and import a track, you can tap “Add New Track” to add more tracks. To snip out a part of the audio, just tap the play button to listen to the audio, find out the part, tap to select it and tap “Delete” in the activated menu; there are also other options for processing the selection, including Cut, Copy, Trim & FX. 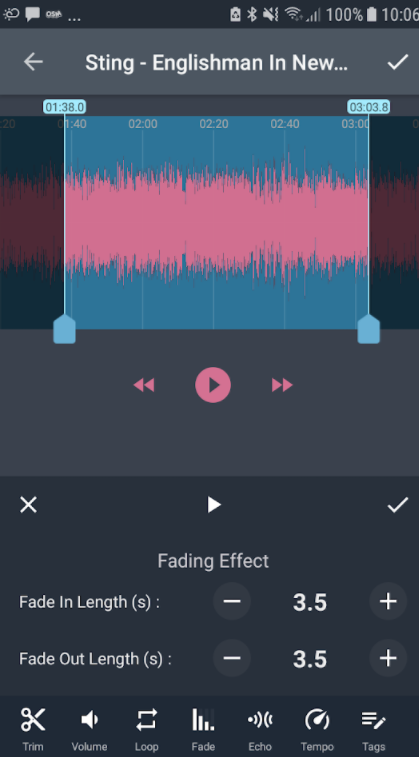 If you want to add audio effects, tap the “FX” option and you will get over 100 built-in sound effects to choose from, like Gain, Reverb, Tempo, Normaliser, Pitch Shift, Delay, Equalizer, Fade, etc. You can undo or redo the operation any time you want. Music Editor: Beat Song Maker also provides you with categorized premium soundtracks so that you can create your own music from them. It allows you to export your music files in M4a format and several others. You must notice that premium soundtracks and premium audio effects have to be purchased separately. Don’t get fooled by its name, Hindenburg Field Recorder can do more. It is actually a feature-rich audio recording and editing app that enables you to record, edit and share audio. It is designed for radio production and field interview so that you won’t have to go back to your office to fetch a whole bag of equipment when breaking news happens. With the “fat-thumbed” design, Hindenburg Field Recorder’s UI is clean and easy to use, making it possible to record in any situation. You can set markers to your recordings. When it comes to editing, it can cut, copy, paste, trim and insert the audio. You can adjust gain, add fade and compression. When you are finished with the editing, you can directly send the recording to Hindenburg Journalist, dira!, DigAS or upload it to FTP, Soundcloud, iTunes, etc. or send it via email. Hindenburg Field Recorder provides a 30-day trial and you need to pay for $29.99 to upgrade to an unlimited version. 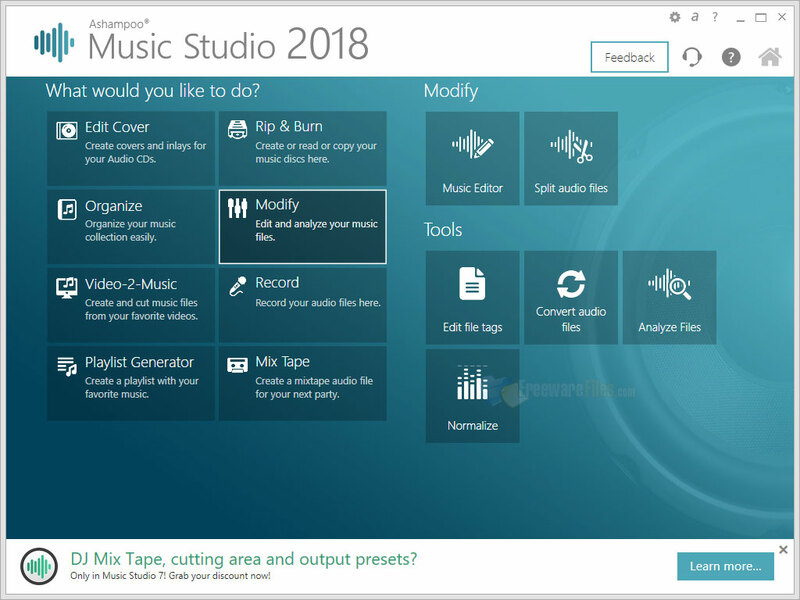 Music Maker Jam is developed by Magix, which provides a series of tools to help with mixing down music tracks, recording your vocals/raps/other sounds in high quality and seamlessly adding the vocal to create your own music. The app itself is more for “pro” users and the UI looks a bit complicated at the initial glance. Luckily, the tutorial overlay comes with a useful explanation of how this audio editing app works. 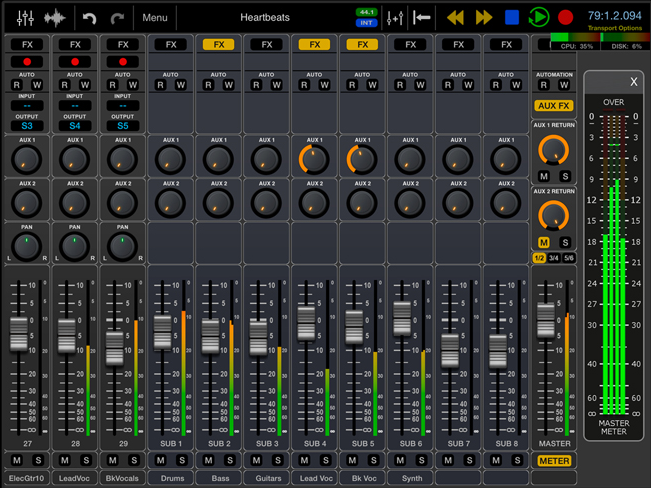 Music Maker Jam has an 8-channel mixer that makes pro-level music mixing easy. It provides 100 styles to create your music, including jazz, house, dubstep, techno, rock, funk, hip hop, drum and bass, etc. Meanwhile, it provides thousands of professional loops like saxophone samples, soul vocals, etc. You are allowed to change the song structure, tempo, harmonies and add audio effects with real-time preview. When you are done with your music editing, it enables you to upload the files to SoundCloud. You can also share the music with your friends and the global music community, displaying your musical talents and fresh sounds. Music Maker Jam provides a monthly based update to keep you informed of the latest and hottest music trends. 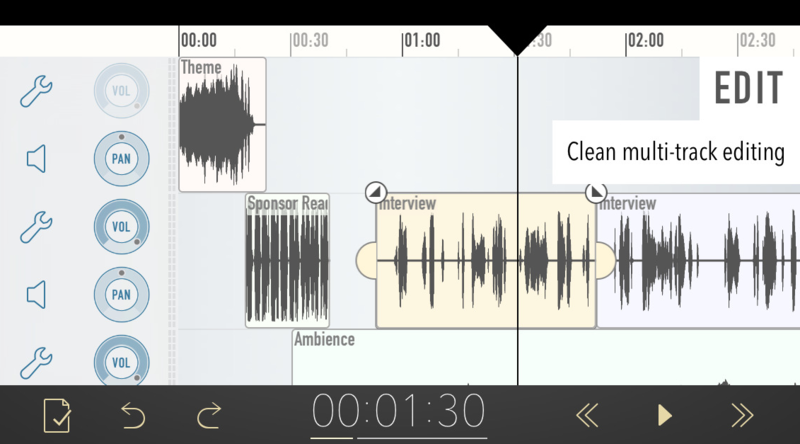 Ferrite Recording Studio is a professional recording and multi-track audio editing app for iPhone and iPad. It is designed for artist and musicians to quickly record and edit audio and realize musical ideas on the move without having to use the DAW on a laptop or desktop. It makes the audio effects and automation available anytime, anywhere. It is also designed for podcasters, journalists and people who are away from the studio but need to process the audio for podcasts, radio journalism, audio presentations, lecture recordings, etc. 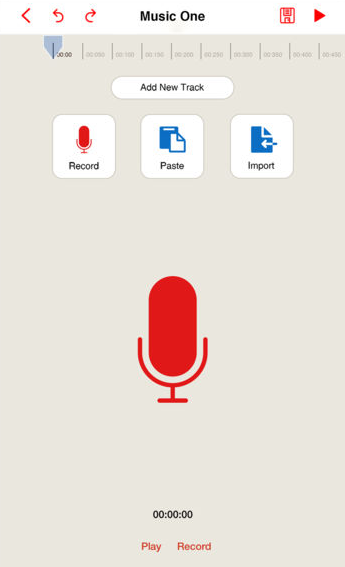 Ferrite Recording Studio works like the voice memo app: just tap to start record. You can record hours of audio as long as your device can handle it. During recording, it allows you to bookmark the moments, which will be flagged up in the later editing work, making it easy to jump right to them. You may need this feature to help remove some noises or take out some inappropriate language. Ferrite Recording Studio comes with a full audio editing suite to enhance your recordings and imported audio files. It supports multi-track editing. 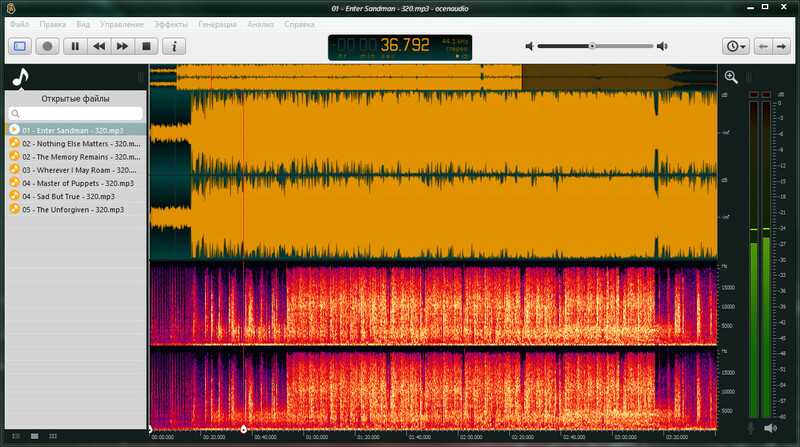 With the zoomable waveform, you can see hours of audio at a glance or perform highly accurate editing. For each track, in addition to the basic editing features like cut, copy, paste, crop, slice, merge, delete, etc., you can change the volume, pan and add fade as well as many audio effects. Undo and redo can be helpful when you are trying new ideas. When you are finished with the editing, you can share the audio via email, social medias or upload it to Dropbox, AudioShare, etc. Ferrite Recording Studio’s limited version is free to use. You can pay a one-time fee of $39 to unlock more advanced features like Per-track effects, Noise reduction, Auto-levelling, Archive projects, custom keyboard shortcuts, etc. 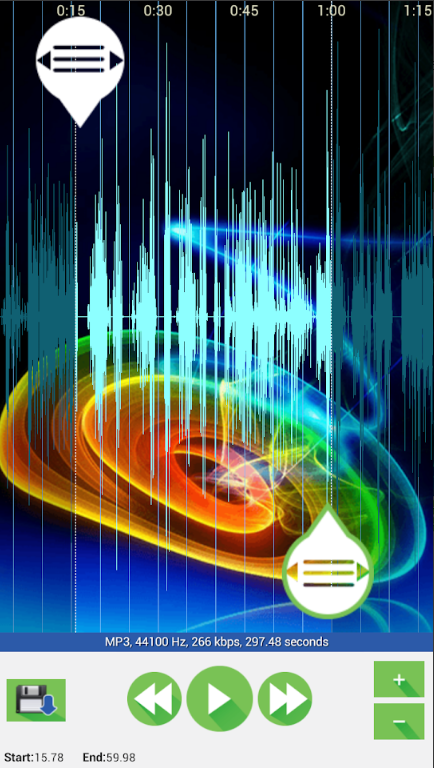 TwistedWave Audio Editor is a fast and intuitive audio editor app for iPhone and iPad. You are allowed to record and edit any audio just like using a home studio. Similar to its online and desktop version, the iPhone/iPad version provides a visual real-time waveform for you to work on. You can drag the waveform to move it or pinch/stretch to zoom in/out for better view & operation. You can cut, copy, paste & crop your audio, amplify or normalize the sound level, add audio effects like fade in/out as well as various filters. Undo and redo are also supported. After editing, it allows you to upload your audio to FTP (multiple FTP accounts supported) and send compressed AAC files via email or send it to iCloud/Google Drive. TwistedWave Audio Editor comes with a very familiar UI and if you are experienced with any other typical audio editor software, you’ll master it in no time. You need to pay $9.99 for the portable version. Auria Pro is a professional audio editing app which works only on iPad. It’s a simpler DAW app, but still, it has so many functions and menus, which will not be suitable to align on the small iPhone screen. Auria Pro can also be used for post-production. It’s more for an expert to use and the price ($50) is a bit more expensive than most other audio editing apps. It will ask you to buy the license when you open it. After the purchase, it will show you a series of buttons and dials. Auria Pro allows simultaneous multitrack recording up to 24 tracks with compatible hardware. Auria Pro’s touch-based editor gives you full control of your music with editing features like Cut, Copy, Paste, Split, Join, etc. There are many flexible snapping tools to let you snap to events, cursor, bars, beats, etc. You can import audio files from other apps or only audio sessions from Pro Tools, Nuendo, Logic and many other DAWs via AAF import. You can employ plugins to finetune the tracks. You can add various audio effects and even buy more optional audio effects plug-ins via In-App purchase. Meanwhile, a very powerful mixer is provided. Auria Pro comes with comprehensive MIDI capabilities, real-time audio warping, transient slicing, killer synths and many more. Auria Pro supports iOS-compatible external hard drives, making it easy to save and restore your Auria projects to external media. As the world’s most popular operating system, Android OS is now used by over 2 billion people, which means Android has a much larger install base and brings more smartphones sells. 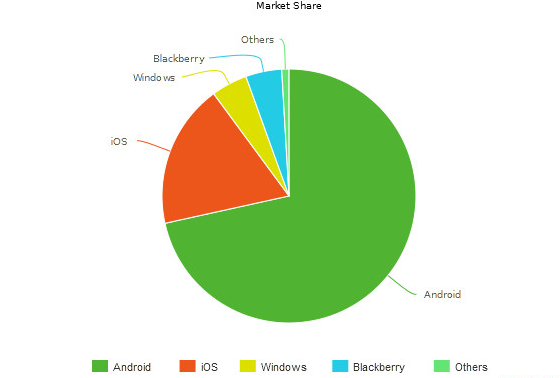 Here are several facts that make Android even more popular than iOS. There are more smartphone and device manufacturers use Android as their OS while iOS is limited to Apple-made iPhones & iPads only. In 2007, the Open Handset Alliance (OHA) was established to compete with iPhone and Google granted an open-source license to manufacturers. That’s why Android significantly increased its market share. When older feature phone OS was ditched, most smartphone makers opted to turn to Android. Second, the money thing – Android devices span all price ranges. We all know that Android devices have varied price range, from high-end to low-end, which is very important for the market in developing countries where Apple’s most affordable iPhone is still beyond most people’s budget. Here’s the story: once I tried to hire a freelancer in India to do an iOS project for us but most of the qualified freelancers do not have an iPhone – almost all of them were using Android phones. Finally, I had to turn to US freelancers. Third, Android has wider device compatibility. iOS is a closed mobile platform, which makes iOS devices generally more secure than Android devices. Yet, security is not the only factor to consider in our daily life – Android provides more choices and more flexibility, which means that you can have a Google Home speaker, a Samsung Galaxy Note, a Huawei/Honor phone, a Fitbit watch, an Amazon Kindle, etc. and they can all work together, making data sync and transfer much easier and more efficient. Now, here are our top picks of the best Android audio editing apps. MP3 Cutter is an easy audio editing app that allows you to cut and edit audio on a waveform workplace. You can load and import MP3 files from the SD card. To cut the audio, just import the file and tap on the waveform to select the part you want to cut with the forward and backward selector. It includes an MP3 player to play the MP3 audio. It is also able to merge audio files. You are allowed to save the audio to SD card and set it as your ringtone. MP3 Cutter costs you $1.99 only but it cannot record audio. It will be difficult to edit large audio files: the timeline can’t be condensed short enough to fit on the screen and the processing speed will get much slower. It can only cut MP3 format files. 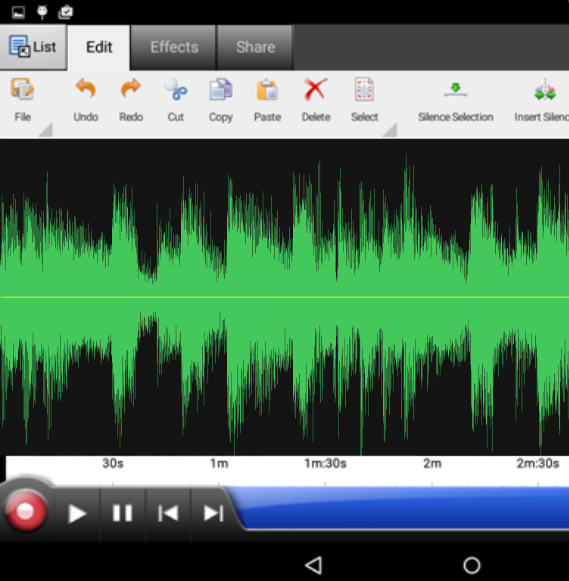 MP3 Cutter is an affordable and simple Android audio editor & merger app with straightforward UI. It is designed more for casual users or people who are looking for a quick audio cutting and editing solution. It may lack many important features of a typical audio editor but it will get easy jobs done in a few steps. AndroSound Audio Editor gives you a handy interface for audio editing. It helps you record, edit and trim your audio, add audio effects and even produce ringtones for your smartphone. Once you open AndroSound Audio Editor, it shows you two buttons: Music & Videos. Tap Music to import music from the list. The list will show all your audio files instead of showing them in different folders. To make importing audio files easier, you can sort them by title/artist/size/duration/date and you can search among them. You can also tap Videos to import video but you should notice that many video formats may not be supported; some formats may lose the sound after editing due to codec reasons. You are allowed to trim audio, add fade in/out & crossfade, add echo, adjust the volume, edit the audio tags, change the speed, etc. You can export your audio in MP3, AAC, FLAC or WAV format. You can also start a new recording to record whatever you want and edit the recording. It enables you to directly assign ringtones to your contacts. 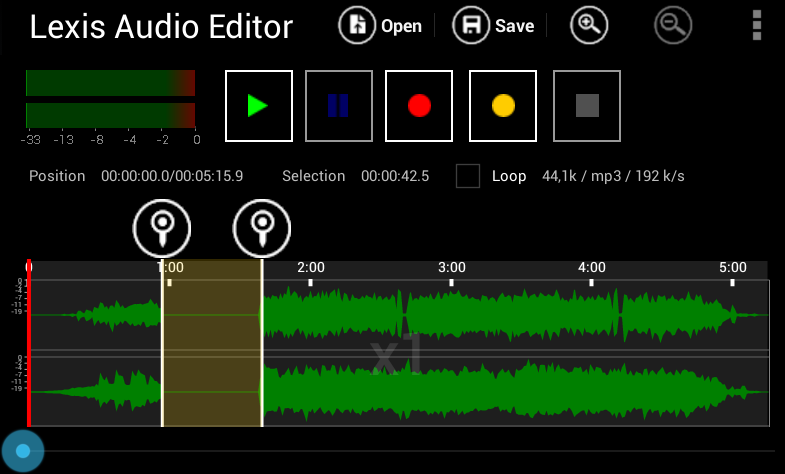 WavePad Audio Editor is a famous audio editor software provided by NCH Software, which also comes with an Android version. The app allows you to record, edit, add audio effects and save audio or share it. 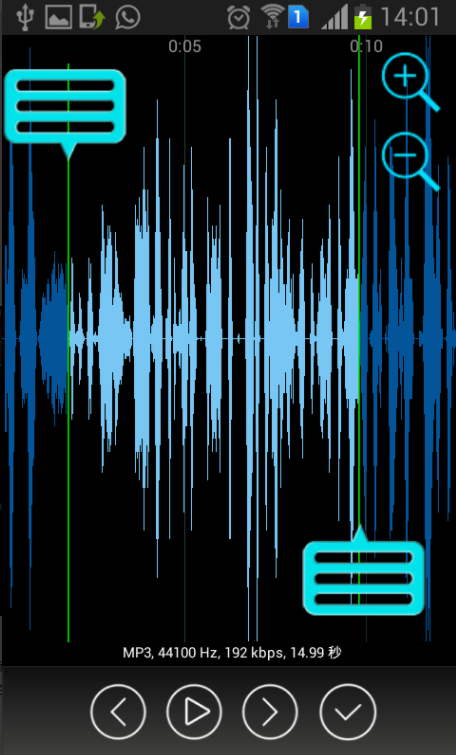 WavePad Audio Editor can record both music or voice in a few simple taps. It supports auto-trim editing to remove the silence parts at the beginning & end of the recording. It also allows voice-activated recording to save your space. You are allowed to edit the recording or import audio from other apps. There is a filelist that shows your recordings and audio files, where you can choose the audio you want to edit. The app comes with a very familiar waveform interface like its desktop version, on which you can cut, copy, paste, trim, delete & mute the selection. In the Effects tab, you can add many audio effects in real time like Fade in/out, Amplify, Normalize, Equalize, Reverse, Speed Change, etc. After editing, in the Share tab, you can save the audio file locally (Export to Folder), share it with some other apps (Choose App) or upload it to FTP (Export to FTP). It does not support Google Drive or Dropbox. WavePad Audio Editor allows you to edit multiple audio formats but the free version only outputs WAV format. You can upgrade to an “MP3” version via in-app purchase (different plans from $0.99 to $9.99). Meanwhile, the free version comes with other limitations so we suggest an upgrade if you are a serious user. Sometimes there will be a blank or grey screen bug and their tech team are now fixing it; meanwhile, when dealing with certain formats with certain codecs, it may require unbelievably big file space, even if you are just dealing with a 30MB file. 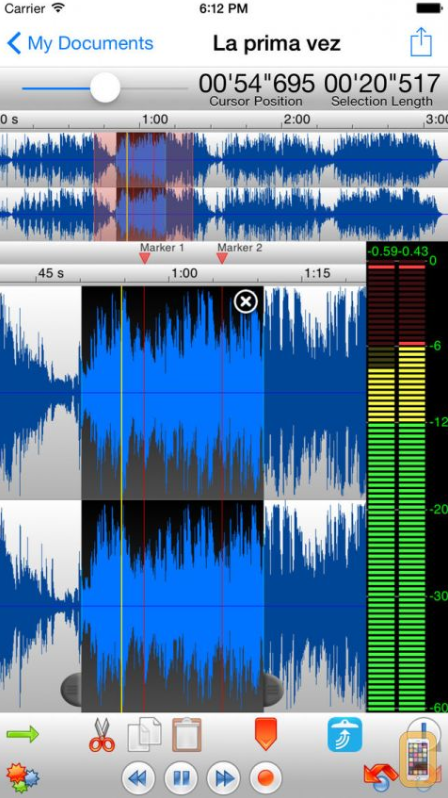 Mp3 Cutter & Merger is a very handy app for Android audio cutting and merging. It supports only MP3 format. 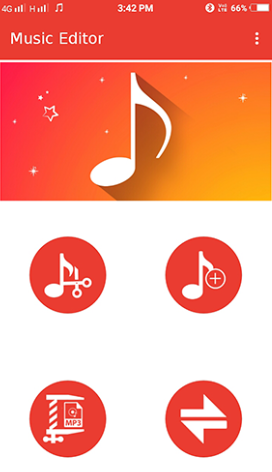 It is very suitable for users who want to create a ringtone from beloved songs or combine audio for gapless playback. When you open the app, there are four buttons: To cut the audio, tap Mp3 Cutter; to merge MP3 files, tap Mp3 Merger; to find your saved trimmed audio, tap Trimmed Tones; to find your saved merged audio, tap Merged Tones. In the MP3 cutter, it gives you a filelist, showing you all the MP3 files on your phone and you can search and select the file you want to edit. All MP3 files are listed together but it will show you the source folder info of each file. Cutting/Trimming audio is easy: tap to select the start & end of the part you want and then tap the Save button at the left bottom. 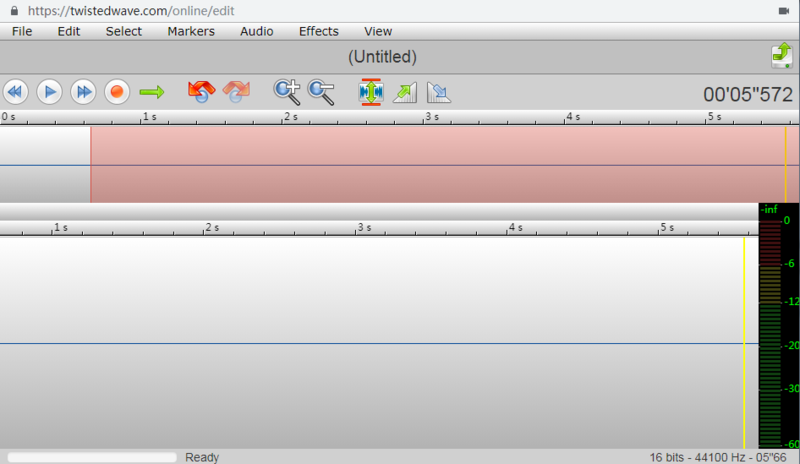 You can listen to the audio and zoom in/out the waveform before cutting to decide which part is needed. When you have successfully saved the trimmed/merged audio, you can directly assign it to your contact as a ringtone. Mp3 Cutter & Merger does not provide any audio effects but it’s a very efficient tool for cutting and merging MP3. 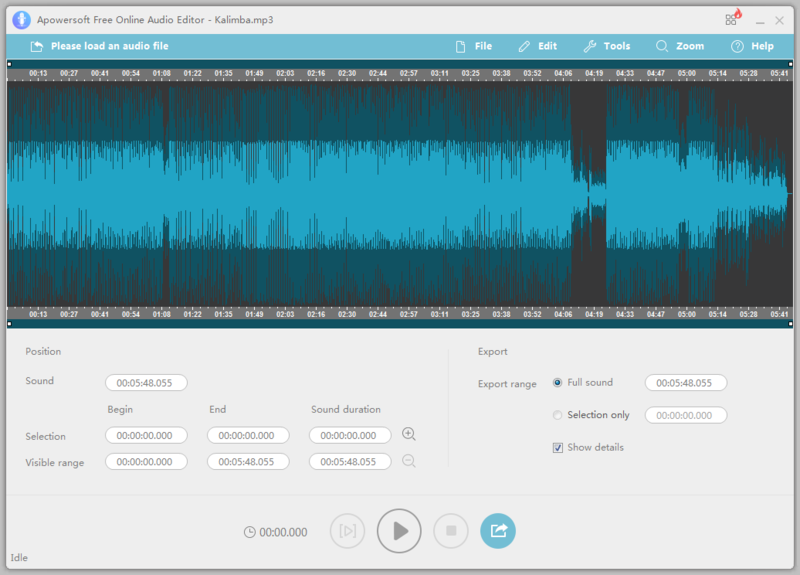 Lexis Audio Editor feature-rich and ad-free audio editor app which enables you to record and edit audio files and save the audio in the format you want. Unlike many other audio editor apps for Android, it provides all features of the paid version in its free trial except the MP3 output format – the free version supports WAV, WMA, AAC, M4A & FLAC output. Basically, you can have a taste of everything it has to offer before you decide to pay for it. Tap Open to import the audio file into its waveform workplace and then you can perform editing operations like in other editor apps: tap to select the part you want to edit and do what you have to do: you can cut, copy, paste, delete & trim the audio. It provides fade in/out, normalization, equalization, speed change, pitch shift and noise reduction and you can mix the current audio with another audio file. To record new audio, just the red round REC button. Something amazing about this app is that it can record into the existing file and import another file into the existing file, which is a rare feature in other editor apps. Lexis Audio Editor requires at least 500MB of free memory on your first SD card to edit a 10-minute 48k stereo sound file, so make sure you have enough space to use it. Its interface is a bit dull and could use some rearrangement. Sometimes there will a be a loud pop at the start of the edited FLAC files and sometimes there will be a short silence at the end, which could be annoying if you need to delete them afterward. 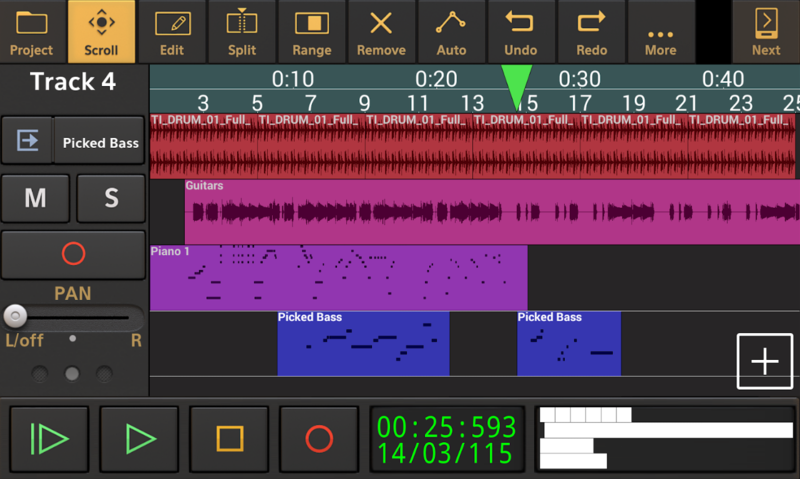 Audio Evolution Mobile Studio is a powerful audio and MIDI recording and editing studio app for Android. It provides support for more than 250 audio and MIDI interfaces. It allows musicians to create beats & synth tracks with a piano roll/ external MIDI keyboard. Audio Evolution Mobile Studio allows multitrack audio recording and editing. You can unlock the MIDI sequencing feature via in-app purchase. 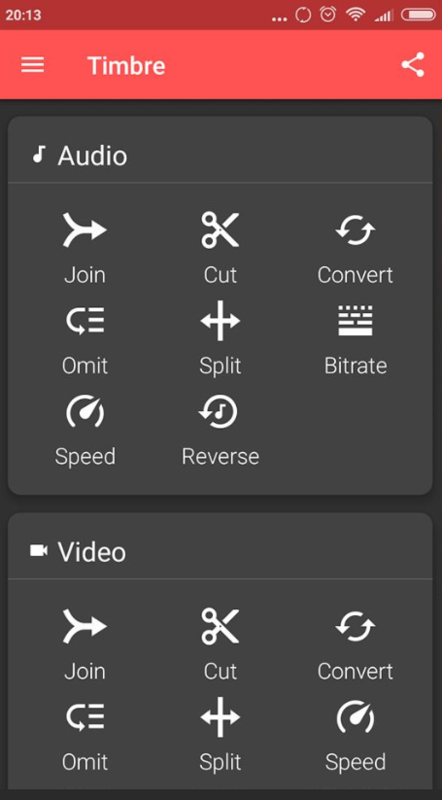 You can import WAV, MP3, AIFF, FLAC, Ogg and many other audio formats (M4A and more formats are supported on Android 4.1 or higher versions) to edit. You can cut, copy, paste audio, add real-time effects, mix audio, etc. There are a mass collection of free and paid audio effects. You can undo or redo any steps, trying new ideas without worrying about irreversible actions. It provides professional loops and automation tools. The project can be interchanged between its Android and iOS versions; meanwhile, you can export the audio to other DAWs. This is a portable professional audio editing studio with many pro-level tools. Inexperienced users may flinch on the sight of its interface, menus and buttons. It is recommended only to pros. Music Editor is a handy audio editor app to edit audio. It is also able to convert audio, merge audio files into a single file, and compress audio. When you open the app, there are four buttons. To edit audio, you need to tap the button with the “+” first to import your audio. It will show you a list of music on your device with the filename and length of each file. You can choose the one you want to edit to import. Then, you can tap the MP3 Cutter button to edit the audio file. You can cut audio in a few easy steps: just use the two sliders on the waveform to choose the part you want to keep and tap the tick on the right top to keep it. You can tap the play button to makes sure if this is the part you want before cutting. There is an audio converter that can convert your audio files to MP3, WAV, M4A and AAC formats. Unlike many other audio converters, it features converting only a part of the audio file. It helps you do a much more efficient work if you need to cut a part of the audio and convert it to another format. The MP3 Joiner provides fast audio merging. You can add two tracks to merge them: tap Select 1 Music to add one track and then Select 2 Music to add another. Tap MP3 Joiner to join them. The Audio Compressor allows you to compress the audio file or just a part of it into three bitrates: 64 kbps 128 kbps & 256 kbps. You can upgrade to a pro version the provides more advanced features like the ringtone maker, video cutter, video joiner, video to MP3 converter, video compressor and resizer, video splitter, slideshow maker, video player, etc. Music Editor is very easy to use but the language of the description on its Google Play page is a disaster. So, don’t get fooled by its lame English page or UI – it works quite well. The audio editor cannot compete with other apps because it is only an MP3 cutter without any effects of basic editing features. The MP3 Joiner feature only supports MP3 input. Timbre is an audio and video editing app which can edit, join and convert audio and video files. It works for free without ads. The most exciting feature is its text to speech ability. Just like the Music Editor from SmartApps, Timbre’s “editing” is just cutting, lacking some basic features & effects of a typical audio editor app. You can import your audio, play it in the player, use the slider bar to choose the range you want to cut, and tap the scissors button to keep it. There is also an audio omitter to snip out a part of the audio. An audio splitter is provided to split your audio file into two separate files. More audio formats are supported compared to other audio editor apps: WAV, MP3, FLAC, ALAC, M4A, AAC, WMA, OGG, AIFF, PCM and WV. You are allowed to convert the audio to other audio formats and change the audio bitrate. The speed changer enables you to speed up or slow down the audio/video.